After a long ten hours (or more for some) of travel, we had finally arrived in Berlin. The new city greeted our jet lag and fatigue with cool temperatures and pouring rain as we stepped off the plane. The ten of us, a group of Colorado College students with varying degrees of interest in Feminist & Gender Studies, gathered after claiming our bags, most of us meeting for the first time. 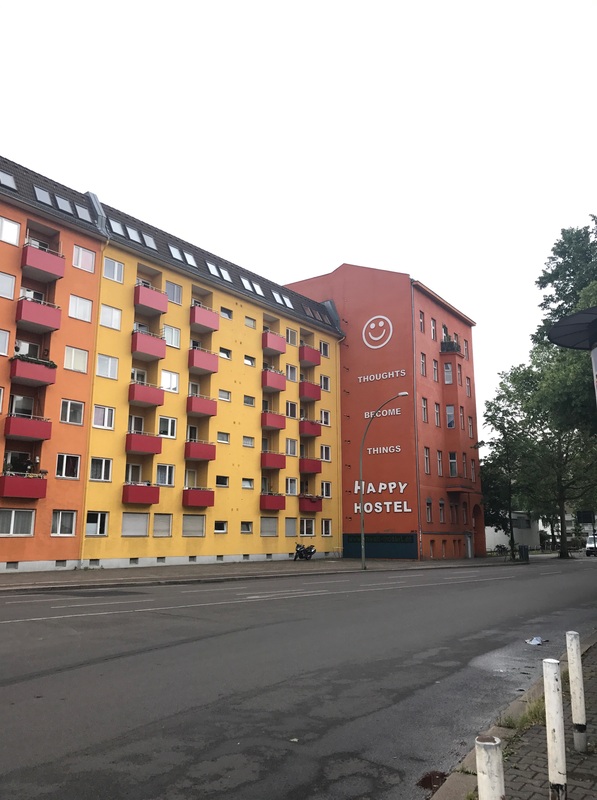 After a while of driving through streets of mostly earth-toned buildings, looking especially drab due to the weather, the van eventually pulled up to a bright orange structure: The Happy Hostel. At our temporary home, we met our professor, Heidi R. Lewis, and course associate, Dana Maria Asbury. Over the next three weeks, they will be taking us through many different tours and activities in order to teach us about how identities of marginalized people are constructed in Germany. Once we settled into our new temporary home, we fought the urge to sleep by starting our required readings and films. Of the six analytical pieces, two really resonated with me: Sabine Offe’s “Sites of Remembrance? Jewish Museums in Contemporary Germany” was one of them. Here, Offe discusses how Jewish museums are used as both physical sights and institutions for their visitors to access the memory of Jewish relations in Germany, as well as for German visitors to deal with secondhand guilt. These ideas were very new to me and were especially intriguing due to my Jewish heritage. I had always been on the other side of the conflict, related to a victim, rather than being a part of the “guilty” third-generation. Because of this, I only thought of Jewish museums as places of mourning and remembrance. I had never thought about how museums serve as places for very different things for those affected (a place to remember what happened to them or their loved ones) and those who are or feel responsible (a place to deal with secondhand guilt). Another piece that was particularly memorable to me was “We Don’t Want To Be the Jews of Tomorrow”: Jews and Turks in Germany after 9/11” by Gökçe Yurdakul and Y. Michal Bodemann. This work discusses the inter-ethnic relations between minorities and immigrants—specifically Jews and Turks—in Germany, which I was not previously informed about. This reading forced me to think about how unaware Americans generally are of other nations’ inequalities and power relations. Our country is very focused on itself, and our media is filled with mostly American politics, stories, and events. Many other countries, however, are informed about most of the issues occurring in America. This reflects extremely poorly on the U.S., and makes me question our media’s priorities regarding the distribution of information. The two films also had an impact on me, especially The Holocaust: What the Allies Knew. This documentary analyzes World War II, and presents evidence of the allies’ early awareness of genocide, examining why they often did not do anything to stop it. Though I had learned about World War II in high school, the curriculum never mentioned anything about the allies’ prior knowledge of concentration camps. I found this information extremely shocking and disturbing, and I also reflected a lot about how it is rarely discussed. A lot of history that casts a country in a bad light is not included in our schools’ curricula, which is problematic because it tells a false narrative and continues to add to the cycle incorrect information being fed to the American people. After doing some work and resting at the hostel for a while, the group got together to look for food. We hopped on the (somewhat confusing) public transportation and headed toward a neighborhood called Kreuzberg. While exploring the area to find a restaurant, we stumbled upon a large crowd of people listening to live music. We got closer to see what it was for, and discovered that we had ended up at Berlin’s Karneval der Kulturen (Carnival of Cultures). The carnival included multiple stages, bars, activities for children, and dozens of food stands filled with cuisine from around the world. It also featured a parade that celebrated different cultures, which we, unfortunately, did not get to see. 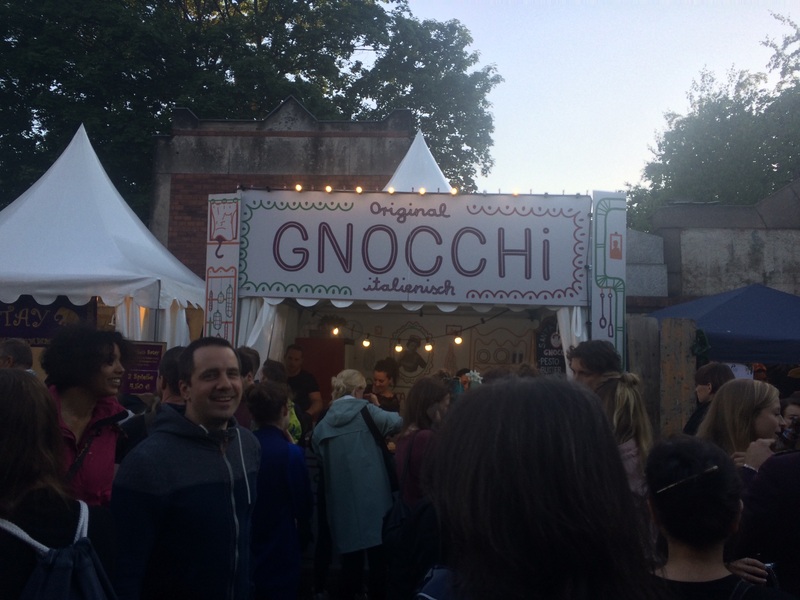 Despite missing out on that, we spent our first night exploring the festival, eating amazing food, and getting to know Berlin and its people a little better (while also getting to know each other). The next day we traveled to Heidi’s flat to discuss our expectations for the course. Though most students’ hopes for the class were similar to those of Heidi and Dana and each other, many people had at least one personal learning experience they wanted to get out of the class. One talked about how their goal was to learn more about queerness and the white washing of the LGBTQIA+ community in Germany. Another wished to find out more about racism in Germany and how it manifests itself in Berlin, which led us to discuss global racism and how Americans and United States media are so focused on their own country that many people from the U.S. are unaware of inequalities and events occurring elsewhere. My biggest expectation was to learn about what it’s like working for a non-profit organization when we visit some during the course, since I have interest in the field. We also talked about our expectations for Heidi and Dana. We let them know that we expect them to be understanding and supportive both regarding the course and not. The expectations mentioned were not solely about the academic course; some regarded the experience of travelling abroad with a group. There was a discussion about sharing space, both with the citizens of Berlin and the members of our group. Multiple people mentioned an extremely important factor: discomfort due to privilege. As Americans, no matter how oppressed each of us may or may not be back in the States, we automatically have a certain privilege in Germany. For example, most of us do not know German, but most Germans know English. As Americans, we can walk into places of business and other German spaces speaking English with few problems, if any at all; we will most likely be able to communicate with the employees without even trying to speak their first language. This privilege we have as Americans, as many different privileges often do, may make us feel guilty or uncomfortable while we are here in Berlin. Another causation of our discomfort as Americans comes from being stereotyped by Germans due to the current political climate in the United States. We may at times feel extremely guilty; the looks or attitudes Europeans give us may convey that they think we personally agree with the decisions President Trump has made. This discomfort is and will be a challenge for us to deal with, but everyone in the group agreed that it is something we need to and will embrace in order to fully appreciate our experiences here. A few hours after class ended, we met Heidi and Dana at the Berlin Fernsehturm, also known as TV Tower. We were given the amazing opportunity of eating dinner in a restaurant towards the top of the structure. This restaurant was inside of a revolving sphere that rotated 360º per hour. This movement, along with the large windows by our tables, allowed us to see a bird’s-eye view of Berlin from all angles. 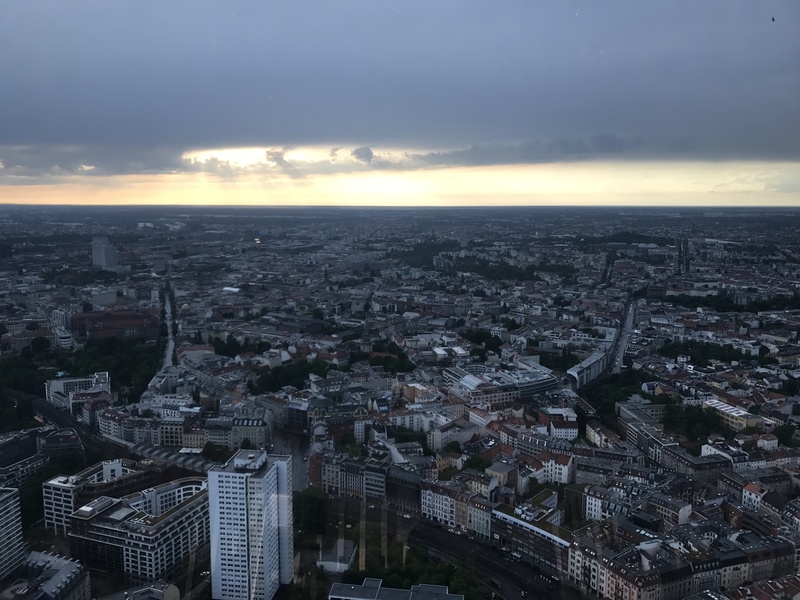 Though the weather was rainy and cloudy, the city was still visible and spectacular to see from so high up. I have never been to Berlin before and honestly did not know much about it before arriving here, so this gave me a better sense of both how the city is laid out and how beautiful it really is. Our group was unfortunately split up between two tables, but it was nice to get to know half of the group a little bit better over an incredible meal. After this dinner and every other activity from the first few days, I feel like I know everyone extremely well considering the amount of time I have known them. The beginning of this trip has been so fun and rewarding, and has only made me more excited for what is to come! 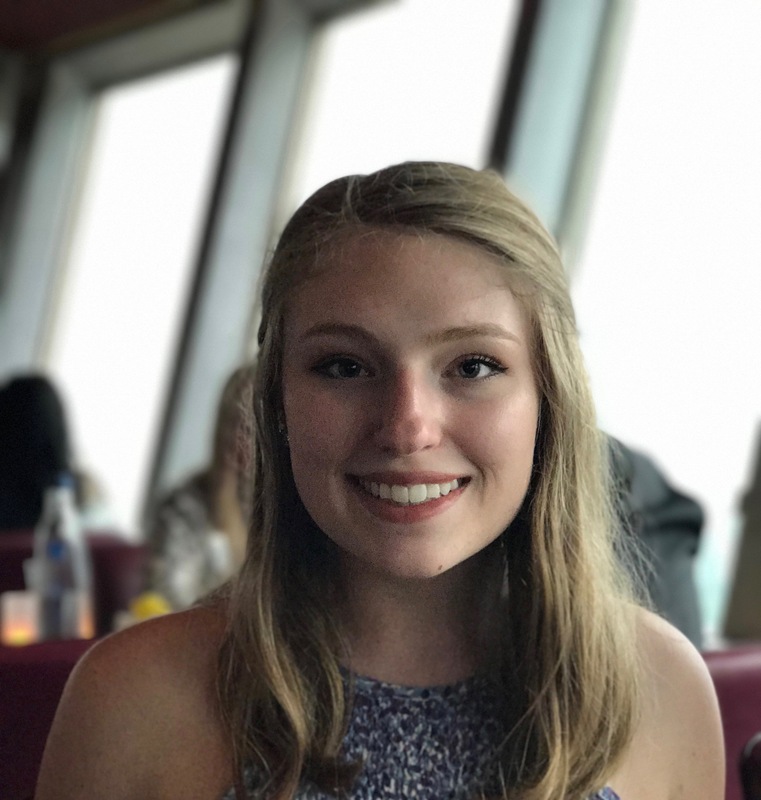 Hailey is a rising sophomore at Colorado College from the Washington, D.C. area. She plans to major in Sociology and minor in Feminist and Gender Studies. At CC, she is part of Students Against Sexual Assault (SASS) and Ellement, an all-women acapella group. This is her first course with Heidi and first time in Berlin, and she is extremely excited for all the learning and exploring to come with this experience.